Mobile phones and other portable technologies have made staying in touch easier than ever. All you need is an internet connection or cellular service, and you can talk to almost anyone in the world instantly. The number of ways to communicate has exploded leaving individuals and companies alike to wonder ‘what’s the best way to keep in contact’. As businesses are becoming increasingly global, portable technology has become the best collaboration tool for a business’s success. At Holistic Communication, we don’t think you should have to sacrifice quality and features because you’re working on the go. You should be able to access your meetings and files whether you are working on a subway, in an airport or at your desk. That’s why we designed Zoom Unified Communication Platform. You get the same capabilities you would with our desktop version as you do with our mobile application. Check out some of our great features that set us apart from our competition. Whether you are connecting from your iPad or Android tablet or through your iPhone or Android smartphone, Zoom gives you capabilities that are unmatched by our competitors. Companies like Skype/Skype for Business have mobile applications with limited features. You can still video chat and send messages, but that’s about it. Holistic Communications believe you shouldn’t be limited just because you’re on the go. Our revolutionary application includes a variety of features you won’t find anywhere else. You receive the best quality audio and video available with Zoom when you use our desktop version. But this quality also translates when you are accessing the unified communication platform from a mobile application. You still receive the best in cloud video conferencing, web conferencing, screen share, secure messaging, and more. 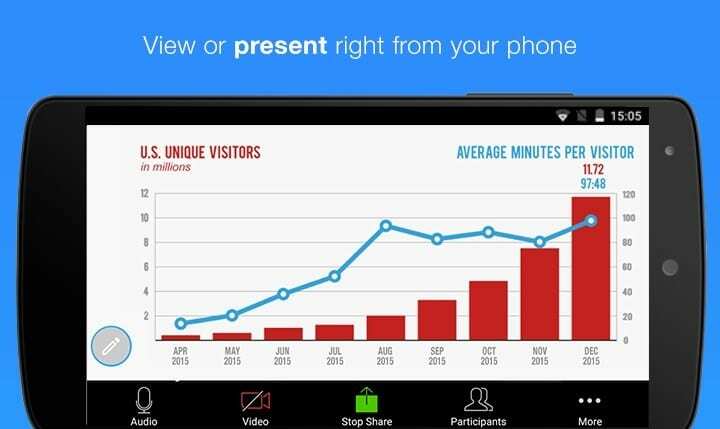 Zoom is the only product on the market that allows you to share your screens and content with other meeting attendees right from your Android or iOS powered device. Screen share allows you to send a variety of content. You can save content shared through Zoom in the cloud along with a MP4/MPA recording of the meeting. When you’re on the move, sometimes taking notes can be difficult. The annotation of meetings with the recordings of the meetings themselves makes it easy to not miss a thing so you can get the job done faster and better than ever before. Because everything is within one platform, you can message team members or clients in the same system and keep everything together. It will save you the time of sorting through your emails and notes and hoping to remember a phone conversation you had a week ago. Zoom Unified Communication Platform provides one easy-to-use system for everything, no matter if you are sitting at your desk or accessing via portable technology. Video conferencing – Cloud video conferencing has never been easier! You can collaborate with your team or clients without having to sacrifice quality. Video calls feature HD audio and HD video and allow attendees to dial in multiple ways including ZoomRooms, the company’s personal login; view-only mode; mobile device through the application; H.323/SIP endpoints including polycom room systems, or free telephone dial in. Save content on the cloud – You can save MP4 or MPA recordings of your meeting as well as any shared content, including revolutionary mobile screen share, on the cloud for attendees to view at a later time. Calendar integration – You can integrate your calendar from Google or Microsoft Outlook and Exchange to ensure you don’t double-book someone’s schedule. Plugins are available for both Google Chrome and Microsoft Outlook to make it easier than ever to hold your virtual meeting. Secure messaging – Not only can you video chat, you can also secure message right within the platform. If you’re grabbing coffee or lunch for the office and someone has a quick question, you can answer it right away before getting back. If you’re traveling for business and a client needs assistance, you can help without having to drop everything to find the nearest Wi-Fi hotspot to access email. The best part? You get all of these features for free! Just as Holistic Communications thinks where you are shouldn’t be a barrier to communication, we also believe effective communication shouldn’t be limited to those who can afford it. Communication is vital for the success of your business. That’s why we want to partner with you to move your business forward. And if you choose Zoom Unified Communication Platform you’re not alone. Over 400,000 customers around the world have chosen Zoom as their complete teleconferencing solution. Our clients range from individuals conducting personal meetings to large enterprises with thousands of employees. They keep coming back because of the quality and quantity of features we offer regardless of how you choose to communicate. If you or someone in your business is interested in the best online meeting tool for virtual meetings, contact Holistic Communications to get started with Zoom today for the best quality whether you are collaborating through computers or Android and iOS portable technologies.